Do nest boxes really work?? Every now and again I get asked this question. Well, apart from my existing photos showing the birds interested in the boxes I decided to photograph some more elusive critters. The Barn Owl. I set up a camera close to one of my multiple-use large boxes and the proof is in the pudding as we say. 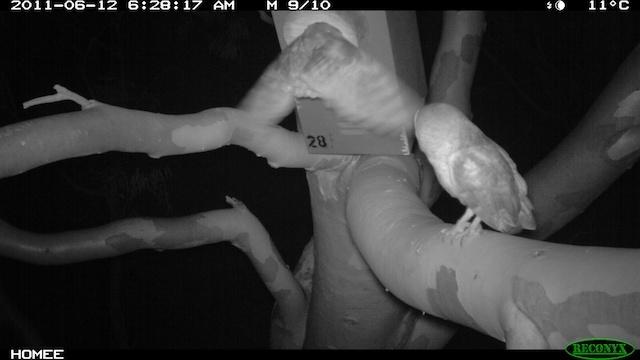 The following images show that a pair of Barn Owls love this box. From studying the images the owls leave and enter the box at about the same time each night. How did I know I had Owls in there. The design is such I can see through the front louvre with binoculars and spotted the owl roosting during the day. That’s when I crept back in the middle of the night when they had gone and rigged up the camera. The owls are so desperate for a home they moved into boxes built for possums. "I'm having a closer look"
Guess who's found a new home??? Joe do you stream your nest boxes on any sites?? Unfortunately I don’t. The box with the Barn owls are several kilometres away from me in a bush reserve. It would need a remote camera with a solar power system. The land belongs to the local government and I’m sure they wouldn’t want to fund it. It would bring some beautiful footage though. Imagine watching Mummy owl bringing in a dead rat and feeding it to the owlets. It would make a great blog…..
A few years ago I did stream a Southern Boobook owl at my home but now I just don’t have the time to set up a camera anymore. I still have my owl though. Thanks so much for your reply! 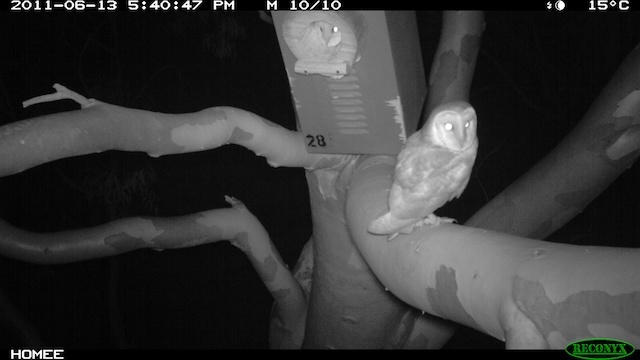 I watch many barn owl box streams around the world, but hard to find any in Australia to watch! So glad there is a nesting pair near you, great to hear. Nice that you have put up these boxes for them as natural habits are fading fast, great work. need some thechnical and practical advice on nestingboxs. have a large bush block in baldivis. Yes, sure Michael, love to help. give me a call and I’ll give you my hourly rate for advice.